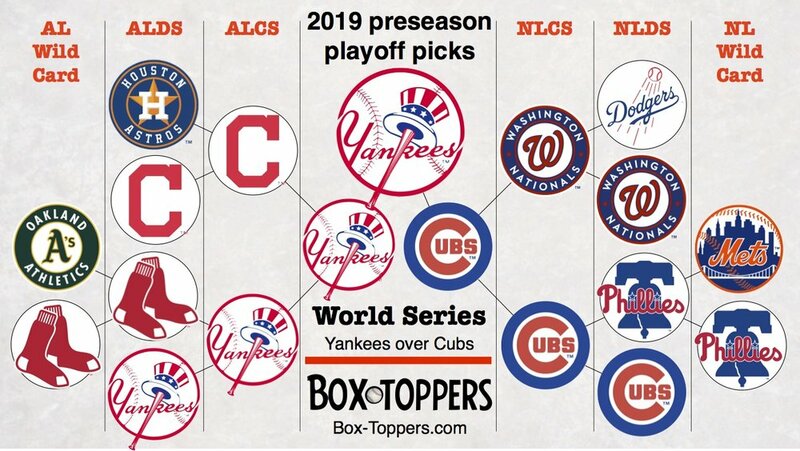 Box-Toppers picks the Yankees to beat the Cubs in the 2019 World Series. Here is the predicted order of finish of all 30 teams in their divisions and their projected win total. The Cleveland Indians: 103 wins. Projected to be the second-seeded American League playoff team. The Boston Red Sox: 101 wins. The 2018 World Series champs are projected to be the top-seeded AL Wild Card team and projected to lose to the eventual champion Yankees in the AL Division Series. The Cubs: 101 wins. Projected to win the National League Championship Series over the second-seeded NL team, the Washington Nationals. In the AL, Box-Toppers projects all five 2018 postseason teams to return in 2019. In addition to the Yankees, Indians and Red Sox, Box-Toppers projects the Houston Astros to repeat as AL West champions and the Oakland Athletics to repeat as AL Wild Card. In the NL, only the Cubs and Los Angeles Dodgers are projected to return to the 2019 postseason from 2018. Three teams from the NL East are projected as new postseason teams—the Washington Nationals (to win the division) and the Philadelphia Phillies and New York Mets (to win NL Wild Card berths). Last year’s National League champion Dodgers are expected to repeat as NL West champions, though with fewer wins than 2018—just 85 compared to 92 last year. The Dodgers are projected to fall to the Nationals in the NL Division Series. Box-Toppers’ win projections and team rankings are largely similar to Box-Toppers’ first-to-30th list of teams in its preseason rankings. However, the team rankings are based only on players’ 2018 Box-Toppers point totals. The win projections and division-by-division team rankings, shown here, are based on a formula that considers players’ Box-Toppers point totals going back to 2014, with added weight given to more recent statistics. The Washington Nationals are projected to win the NL East over the Phillies, even though the Phillies rank higher (fifth) in Box-Toppers team rankings than the Nationals (sixth). Those rankings are based just on 2018 Box-Toppers points. But the Nationals rank higher than the Phillies in points over 2017-18 (fifth vs. seventh) and in points over 2014-18 (fourth vs. seventh). While both teams are projected to win 94 games, the Nationals are decimal points ahead as the formula plays out, giving them the nod as NL East champions. The Yankees are the top team among Box-Toppers three different time periods used in the formula. Players on the preseason roster accumulated the most Box-Toppers points in 2018 (146.2), over 2017-18 (282.8) and over 2014-18 (581.0). The Yankees rise to the top, past the Red Sox, after signing free agent pitchers James Paxton (17.0 Box-Toppers points in 2018 with the Mariners) and Gio Gonzalez (7.7 points in 2018 with the Nationals and Brewers). The Red Sox fall slightly after losing reliever Craig Kimbrel (7.0) to free agency and second baseman Ian Kinsler (6.0) to the Padres. The Cubs largely maintain their 2018 roster that was on top of the NL until the final days of the 2018 season. The Dodgers are not projected to return to the World Series for the third straight season after losing a slew of productive players—Manny Machado (5.7 Box-Toppers points), Alex Wood (5.0), Yasiel Puig (5.0), Matt Kemp (4.5) and Yasmani Grandal (4.5), among others. In addition, Clayton Kershaw had just 8.0 Box-Toppers points in 2018 after earning 20 or more points for seven straight seasons. Battling injury in recent years, Kershaw will miss opening day for the first time since 2010. Box-Toppers projects three improving teams to rise from the NL East. The Nationals, projected to win the division, rise after signing free agent pitcher Patrick Corbin (16.0 Box-Toppers points in 2018 with the Diamondbacks) and hope for a return to form from pitcher Stephen Strasburg (6.7 points in 2018 after earning 22.5 in 2017 and 15.1 in 2016). The Phillies rise to second in the NL East and top NL Wild Card spot after signing outfielder Bryce Harper (7.5 points), catcher J.T. Realmuto (5.5), shortstop Jean Segura (5.0) and outfielder Andrew McCutchen (3.5), among others. The Mets make a jump to the second NL Wild Card spot after acquiring closer Edwin Diaz (9.0), catcher Wilson Ramos (6.0), second baseman Jed Lowrie (4.0), second baseman Robinson Cano (4.0), outfielder Carlos Gomez (4.0) and reliever Jeurys Familia (4.0), among others. Box-Toppers does not factor in unknown players, rookies or prospects in these preseason picks. All projections are based on past big league performance and since a newcomer has no past big league performance, no projection is possible. Since Box-Toppers points are based on team wins, it is logical to extrapolate a team’s number of wins based on the share of accumulated Box-Toppers points from players on their current rosters. However, there is unusual disparity between the high- and low-ranked teams, which made these extrapolations look outlandish and far-fetched. For example, Box-Toppers initially projected the Yankees to win 120 games (the record in a season is 116), while the lowest-ranked Baltimore Orioles were projected to win only 36. Box-Toppers initially projected eight teams to lose 100 or more games (meaning they would win 62 or fewer). Since it is rare for more than a team or two to win or lose 100 games, Box-Toppers employed some mathematical compacting to bring all teams closer to a more realistic-looking center. Top teams had their win totals reduced while low-ranked teams had their win totals increased, so that now only two teams—the Orioles and Royals—have 100-loss seasons projected. We gave the Orioles a benefit-of-a-doubt 50-win season—even though they won only 47 in 2018 and squeezed the Yankees down from 120 to 110 wins—still a historic season. While team wins were mathematically adjusted up or down in this compacting process, each team maintained the overall ranking they held prior to compacting. Last year, Box-Toppers picked four of the six division winners for 2018 correctly and seven of 10 total postseason qualifiers correctly. Box-Toppers also picked the Cubs to win the NL Central, but they lost it in a one-game playoff to the Milwaukee Brewers, finishing one game back. Three teams Box-Toppers projected to be playoff teams in 2018 did not make it—the Nationals and Mets in the NL and the Minnesota Twins, which Box-Toppers projected to be an AL Wild Card team. Box-Toppers picked the Cleveland Indians to win the World Series in 2018. However, they lost in the ALDS to the Astros. Box-Toppers picked the Nationals to win the NL Championship. However, they finished second in the NL East and did not qualify for the postseason. Based on Box-Toppers’ 2018 projections, the Baltimore Orioles had the most disappointing season. (See chart below: A look back at Box-Toppers 2018 preseason predictions.) This, even though Box-Toppers picked them to finish last in the AL East. They did that. But Box-Toppers projected them to have 76 wins. They only had 47. That means they won 29 fewer games than they were forecast to win. The Washington Nationals had the second-most disappointing season. They were projected to win 105 games and make it to the World Series. They won just 82, 23 fewer than forecast. Orioles, 29 wins short of projection. Rangers, 20 (projected 87, actual 67). Indians, 16 (projected 107, actual 91). Royals, 14 (projected 72, actual 58). Conversely, the Tampa Bay Rays had the best season of any team compared to 2018 projections. The Rays were projected to win just 59 games, but won 31 more than that—90. Still, they did not qualify for the postseason. Rays, 31 wins over projection. Athletics, 28 (projected 69, actual 97). Braves, 22 (projected 68, actual 90). Tie, Red Sox and Pirates, 14 (Red Sox projection—94, actual 108; Pirates projection—68, actual 82). Ten teams finished within five games of Box-Toppers projection: Tigers (-2), White Sox (+3), Mariners (+1), Angels (+5), Phillies (+5), Marlins (-1), Brewers (+5), Cubs (+1), Reds (-1) and Padres (-2). In 2013, Box-Toppers picked the Dodgers to beat the Blue Jays in the World Series. The Red Sox beat the Cardinals. Box-Toppers picked the Red Sox to finish fourth in the AL East. In 2014, Box-Toppers picked the Dodgers to beat the Tigers in the World Series. The Giants beat the Royals. Box-Toppers picked the Giants to finish second in the NL West, failing to earn the Wild Card berth. In 2015, Box-Toppers picked the Nationals to beat the Royals in the World Series. The Royals beat the Mets. Box-Toppers was closer, picking the Royals as AL champions, but no cigar. In 2016, Box-Toppers picked the Blue Jays over the Cubs in the World Series. The Cubs beat the Indians. Again, Box-Toppers was close, picking the Cubs as NL champions. In 2017, Box-Toppers picked the Nationals over the Red Sox in the World Series. The Astros beat the Dodgers. Both of Box-Toppers’ picks made the postseason, but lost in the division series round. The Astros were projected to finish second in the AL West, out of the postseason. But in 2009, Box-Toppers did correctly make the preseason pick that the Yankees would beat the Phillies in that year’s World Series (but then, that year, so did everyone else). † Picked as division winning teams in 2018. * Picked as wild card teams in 2018.